I first blogged about this tree last summer when I planted it, well after it’s spectacular Spring color had faded. So, it was definitely time to do an update, with the pretty colors, which have lasted, so far, around 8 weeks. The color is spectacular, just as I had hoped. This is basically a conifer that “flowers”, in the sense that it puts out some bright yellow color, not unlike the yellow of a “Happy Returns” daylily, for at least 2 months here in the Spring. It grows very slow, only a couple inches per year. But, by measuring the candle length the top growth on mine gained at least 6 inches, which is above the norm for this hybrid. So I think planting it in high quality soil, as I talk about in my original post on the tree, worked. Interestingly, new branch nodes on the candles are coming in hot pink. I never knew about this feature of this cultivar, didn’t see it mentioned anywhere, but there are definitely hot pink spots on the candles as in the below picture. It is always nice finding out about an unknown but attractive feature of a new plant. If you notice on the first picture, the candles (that is, by the way, what new growth on such pines is called, “candles”) are longer on top for the vertical growth, than on the sides for the lateral growth. This tells me that this tree will tend to grow tall and skinny, more columnar, than wide and spreading (or short and squat). It is important to note this growth habit. 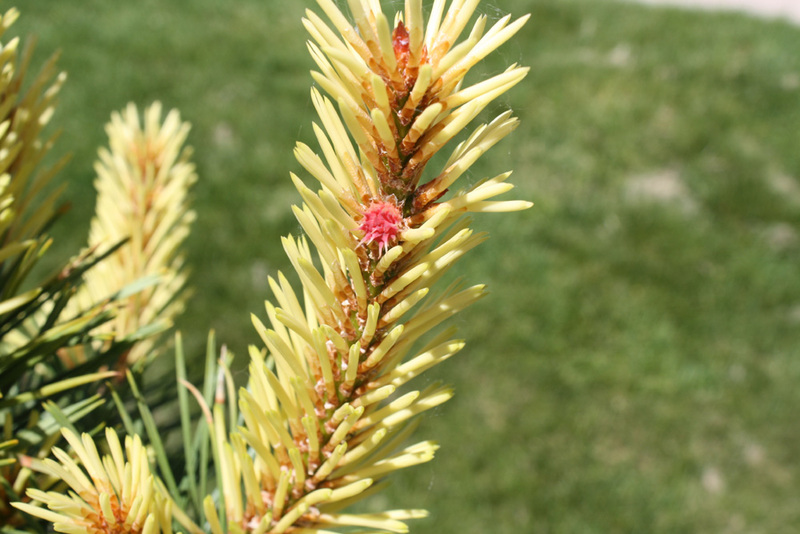 Not all pines, or all conifers, will behave the same way, and how they grow will affect the optimal planting locations. This tree, for me, is right near a path, so it is good it grows tall, and not wide, because if it got too wide it would block the path. On the flip side, for a foundation planting, or underneath a window, it may not work as well because it would get too tall, blocking the house. Growth habit is another attribute to pay attention to when planting a tree or shrub. Pinus Contorta “Taylor’s Sunburst” is definitely a plant I recommend, being only a couple decades old as a cultivar though it can be hard to find, and it on the expensive end, but where else can you find a conifer that provides year round interest, Spring “flowers”, a cool structure (naturally bonsai-ish, hence the contorta species name), and possibly even, when it gets big, food for wildlife via the cones. 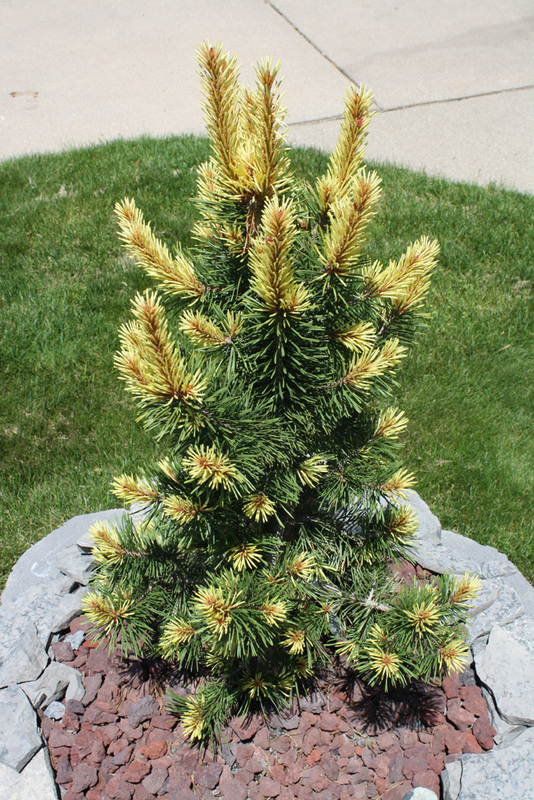 I know of few other conifers that get this bright in Spring, especially with the contrast between the old growth and new (a few, very very fragile and less hardy conifers can be bright yellow, but they’ll be all bright yellow), and I certainly know of no Spring flowering trees that are evergreen (atleast here in zone 5). This tree is definitely unique. Wow! What a gorgeous pine. Thanks for sharing. I’d love to hunt one down, but I doubt it would do well in my zone 10 climate. I have several Pinus contorta contorta (beach pine), but they’re native. Your blog is beautiful and well organized. I enjoyed reading your nicely detailed articles, and I’m sorry for the damage those nasty critters did to your apple tree. Sometimes they sure can be a real pain. Unfortunately.